DUMP BOX WITH LOCK & RIDE CARGO SYSTEM: With a 500 lb. 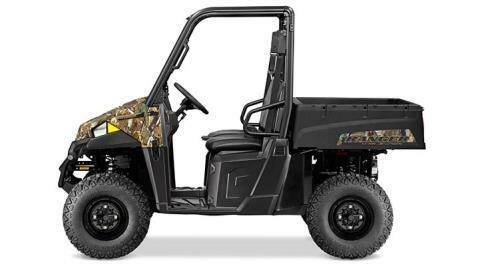 (227 kg) capacity gas-assist rear dump box and a Lock & Ride cargo system that accommodates accessories that go on and off in seconds, RANGER EV Li-Ion is the perfect partner for work and play. 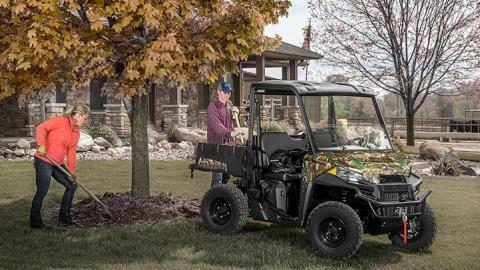 THE LITHIUM-ION ADVANTAGE: RANGER EV Li-Ion is the industry’s first off-road vehicle powered by Lithium-Ion technology. 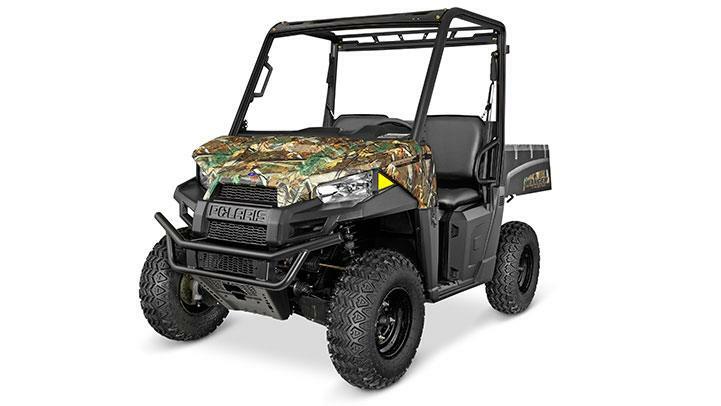 This pure electric machine is the epitome of clean, quiet and efficient power with unmatched range, quick acceleration and smooth off-road performance. UNMATCHED RANGE: RANGER EV Li-Ion will travel up to 50 miles* on one charge so you can embark on every adventure with total confidence. Plus, you can select from 3 modes of operation – High for everyday use, Low for hard work and Max Range for greatest distance. Torque and top speed are never limited in Max Range mode. PURE ELECTRIC POWER: The lightweight RANGER EV Li-Ion features a strong 30HP/48V AC-induction motor for quick, smooth acceleration and highly responsive drivability. Li-Ion can charge from any standard, 3-prong grounded 110V outlet, so your ride is always ready when you are. QUICKER ACCELERATION: Due to an improved power-to-weight ratio, RANGER EV Li-Ion goes from 0-20 MPH in less than 4 seconds! LOW MAINTENANCE BATTERY TECHNOLOGY: RANGER EV Li-Ion boasts every electric advantage – stealth-quiet, no gas and no emissions – with little to no maintenance! It has two 100% sealed, self-heating Lithium-Ion batteries onboard that will run for up to 2,000 charge cycles - 3x more than a lead-acid battery. Li-Ion comes standard with a 3 year or 5000 mile factory warranty on the Lithium-ion batteries to back this up. NIMBLE HANDLING: Lighter than base RANGER EV, RANGER EV Li-Ion is an agile powerhouse with a tight turning radius and a full 10” (25.4 cm) of ground clearance. Plus, a 58” width allows it to fit in the bed of most full-size pickups for easy transport. SMOOTH RIDING SUSPENSION: A full 9” (22.9 cm) of suspension travel in the front and 9” (22.9 cm) of Independent Rear Suspension travel in the back plus turf-friendly Carlisle tires ensure a smooth ride on every type of terrain. NEW! DIGITAL GAUGE WITH SPEEDOMETER: This sleek new gauge is positioned directly in front of the driver. It features a digital voltage gauge with enhanced charge monitoring, an analog speedometer and multiple LCD indicators. 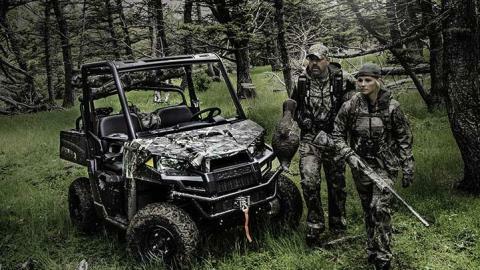 THE PERFECT HUNTING COMPANION: The industry-exclusive, highly modular Lock & Ride® Pro-Fit cab system offers hundreds of cab options including roofs, doors and windshields that are extremely easy to install and remove from dedicated attachment points. With over 20 camo and hunt accessories to choose from, you can equip your stealth-quiet RANGER EV Li-Ion to sneak up on any game.